The second year of the Gaz Shocks BMW Compact Cup, sponsored by MAHA, co-sponsored by Safety Devices and starring eBay Motors BTCC team driver, Tom Onslow-Cole, was played out at the Donington Park Circuit on 1 September 2012. 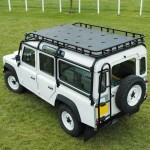 Winner of a free Safety Devices Explorer roof rack announced! MSA/FIA homologated roll cages: do they all have to be made from 45mm tubing now? Due to the recent wet weather conditions, the LRO International Show at Billing has been rescheduled from this weeked to Friday 10th August, Saturday 11th August and Sunday 12th August.